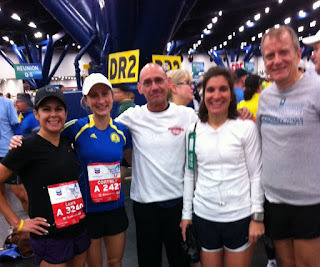 Like most runners in the week prior to the Houston Marathon I exchanged e-mails with other running friends and fretted endlessly about the expected weather conditions on Sunday morning. In most cases such pre-race anxiety proves over-blown as the weather on race day proves better than had been expected, but this morning's race was the exception since the forecast was optimistic. 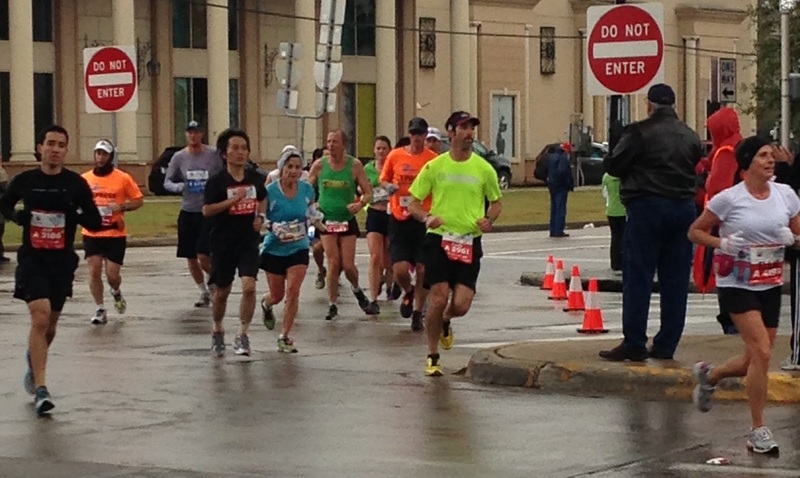 As correctly shouted by a West University spectator at mile twelve, due to the weather the 2013 Houston Marathon is one that all of its runners will long remember. With starting temperatures in the low 40's, and powerful gusty northerly winds between 20 to 30 miles per hour carrying a mix of rain and sleet, despite growing up in Chicago I was ill prepared. Though my clothing was warm enough, I had never practiced running long distances while frequently hurdling over large and growing puddles of water on the road surfaces hoping to avoid a premature soaking. Eventually realizing that my efforts to keep my shoes and socks semi-dry was futile, owing to the cumulative effect of rainfall, splashing by adjoining runners, and the periodic necessity to step in puddles up to an inch deep, I did not anticipate the effect of such hurdling on my hip flexors. The hip flexors are the critical muscle which one engages to lift up ones foot and leg during the running gait, and owing to these puddle jumps this critical muscle was excessively used long before mile 26. 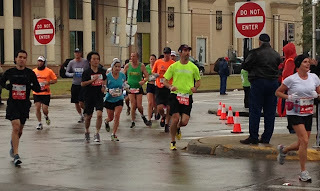 In fact, by the time the above picture was taken from a friend at mile fifteen (I'm the middle runner in green) I knew my proverbial goose was cooked. 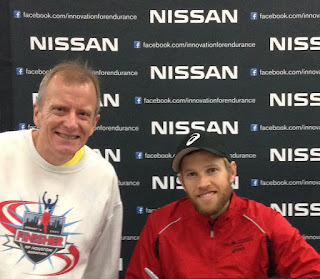 Had I continued to run with my weak and deteriorating hip flexors I would have quickly have had to walk the remaining distance, for which my clothing was inadequate with temperatures by then in the upper 40's. So, I chose to prematurely exit the course (i.e. DNF) at mile 16 since at that point on the course it is the closest possible distance to my home. 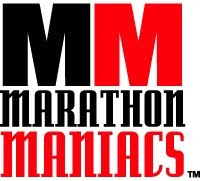 My wonderful wife kindly picked me up, encouraged me to take a hot shower, then brought me back to the race start. There I enjoyed breakfast and congratulated my training partners and friends Xabier and Kim who had both finished well. 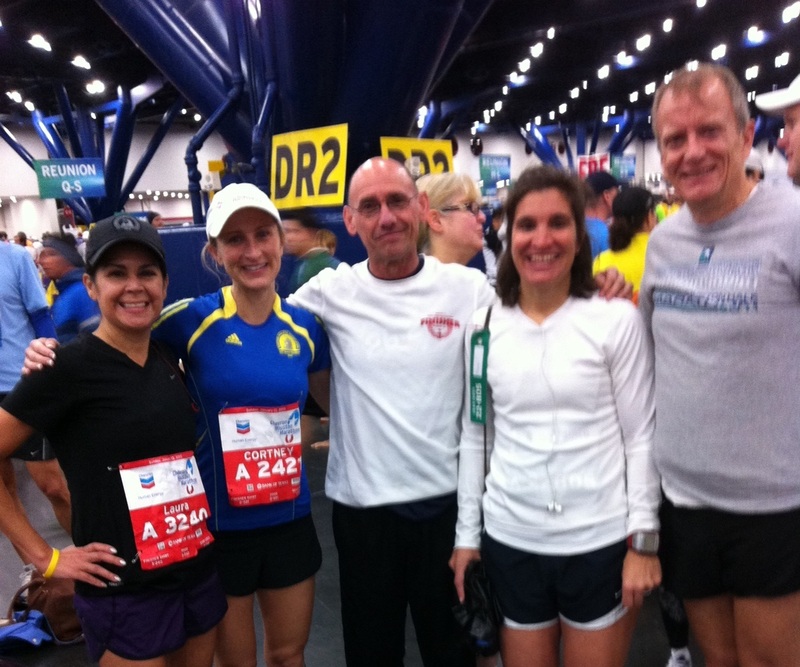 To all of the 2013 Houston Marathon runners, and especially for the many volunteers and supportive spectator along the course, I congratulate you. Being a Chicago native myself I am often surprised by how acclimated I have beome to Texas temperatures. Sorry about the DNF but you will be back to fight another day. I've been there a few times myself and although disappointing it is always for the best. My knee gave out and I had to quit at Mile 17. Oddly, as bad as the weather was, it didn't bother me too much. Then again, I wasn't leaping puddles in a single bound! Good pic with Ryan. His DNF at London would have been a tough one. Sensible decision - you'll be back to good training quicker now.